To record any measurement with a Notch sensor, a license key must be exchanged between the mobile app and the sensors, during a process called activation. This activation process is implemented in the platform SDK and requires internet connection. controls the maximum size of the sensor network your users can build up (see size_allowance). is able to activate up to 255 unique devices. identifies a given sensor network, allowing quick setup when your user changes phones. Each user of your application must have a unique license id. 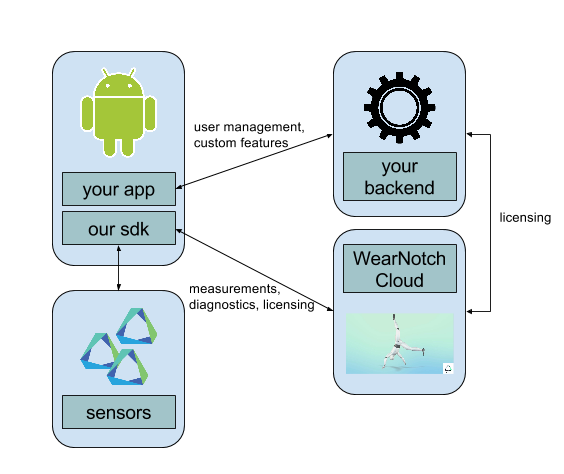 The Notch sensor starts a measurement if and only if a license key was exchanged between the mobile application and the sensors (activation). When a user starts using your application, the Notch SDK expects a license key. You’re expected to build a backend for your application and keep track of your users and their license keys there. So as the SDK initializes, connect to your backend to get a license key for your user. In case the user has no license key yet, your backend should connect to WearNotch license endpoint to obtain one. To identify your user, use any string unique to your user, like her e-mail address. Some charges might apply, contact sales for more details. Your backend should return with the license key, so the SDK initialization can be continued. The Notch SDK caches the license key, so you must do this step only once. The licensing-related endpoint is at https://api.wearnotch.com/v1/license/. You must have an API key to use this endpoint. You must create separate license keys for each user of your application. remote_user string Any string that uniquely identifies your user. The lenght must be less than 128 ascii characters. This field is mandatory. app_code integer Your app code. This field is mandatory. size_allowance integer The maximum number of Notch sensors that can participate in a measurement together. This is a number between 1 and 18. This field is mandatory. Note, there is are restrictions on how the number of permitted activations with a given license key. Don’t reuse them, and don’t hard-code them into your application. Contact support to learn more on these limits (and to fine-tune them to your needs). remote_user The user that was given at the creation of the license key.